These Apple Pie Cupcakes have a surprise center of apple pie filling topped with a creamy maple vanilla frosting, and sprinkle of cinnamon sugar. Whisk together flour, sugar, baking powder, baking soda, salt, and spices in a large bowl. Set aside. Continue on medium speed and add in egg whites one at a time. Whip until fluffy. Pour in apple sauce and almond milk. Pour wet mixture into large bowl of dry ingredients. Stir by hand with a whisk until smooth batter forms. Using a 2 Tbsp ice cream scoop, measure out 1.5 scoops (3 Tbsp) of batter into each cupcake liner. Each liner should be ¾ filled with batter. Place pancake tray on cooling rack for 5 minutes. Then remove each cupcake individually placing on rack. Let cupcakes completely cool before frosting. 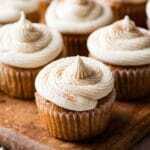 Scoop buttercream into piping bag with desired decorating tip and pipe onto cupcakes. See above for frosting tips! Store cupcakes in an air tight container at room temp for 3-5 days.